The Alfa Laval GJ 8 provides the same flow as traditional, larger tank cleaners, but its lighter, shorter, and narrower build allows for much easier entry and maneuverability. 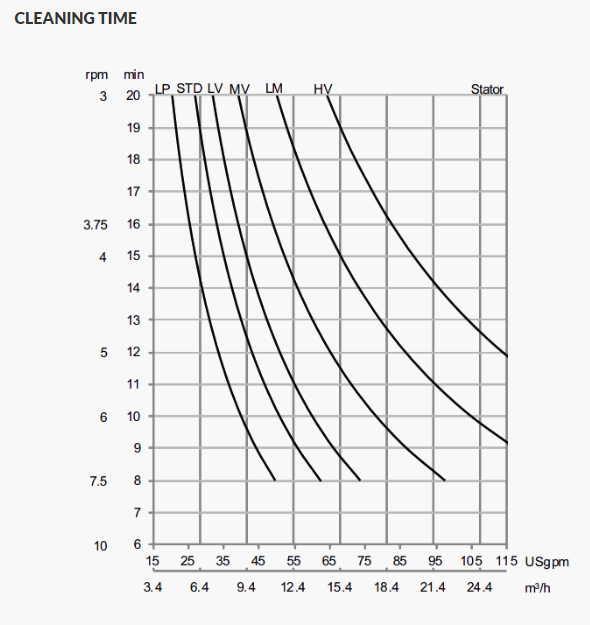 It also offers unparalleled ease of handling in a wide variety of tank cleaning applications. Smaller in diameter than any other fluid driven unit with similar flow characteristics, the GJ 8 does not require any power assists. It fits through small openings while maintaining the flow required to clean larger vessels and its light weight and smaller size makes it easy to move and handle. The versatility of this machine when it comes to pressure and flow make it ideal for most large tank cleaning applications. Wash Cycle Time: 8 to 12 min. For increased wear resistance, the input and output shafts are plasma-sprayed with a Chromium Oxide coating on Stainless Steel. Input shaft thrust is absorbed by a Tungsten carbide bushing. Gearbox bushings are carbon-filled Teflon or other non-cupric material. O-Ring materials are selected for each application. Viton® is standard with Kalrez®, Zalak® and EPDM available. Other materials can be supplied on special order. Rotary shaft and housing seals are spring-loaded, double-lipped and made of PTFE. They are reinforced for extra long wear and protection against leakage, abrasion and deposit build-up. 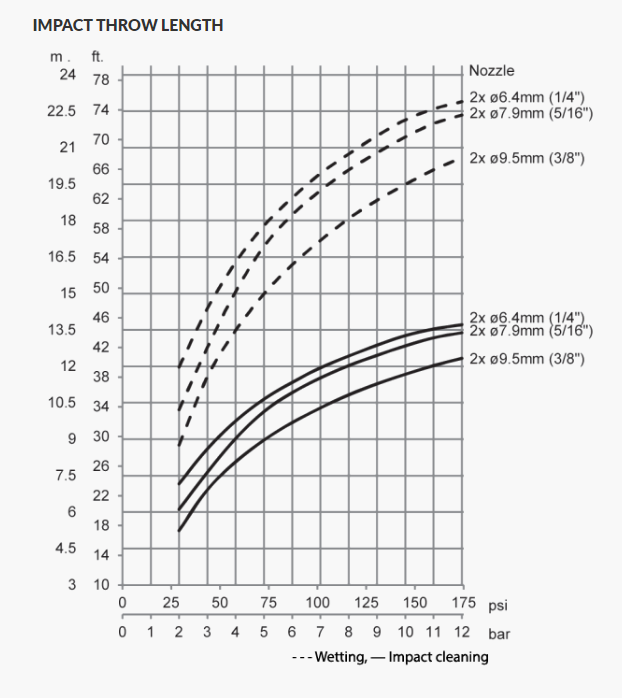 Standard nozzle sizes 1/4 in. (6.35 mm), 9/32 in. (7.14 mm), 5/16 in. (7.94 mm), 3/8 in. 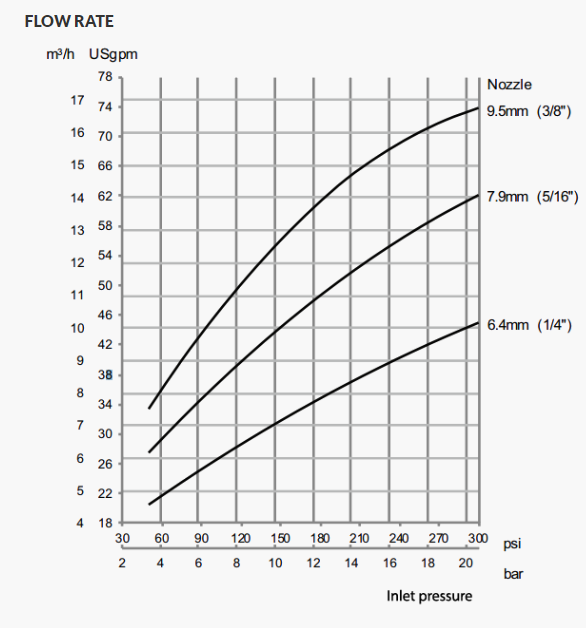 (9.53 mm), 7/16 in. (11.11 mm) 1/2 in. (12.10 mm). Other nozzle sizes available upon request. The wash fluid enters the GJ 8 at the inlet collar where it encounters and spins turbine blades. The turbine blades are attached to the top of the input shaft, the bottom of this shaft is connected to the inside of a sealed, planetary gearhead which then turns the body in the horizontal plane and the nozzles in the vertical plane. 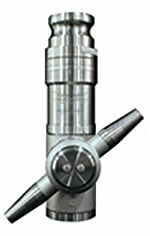 The sealed planetary gearhead has an external casing made of steel, surface-anodized to become stainless. This sealed gearhead is located inside the gearbox, which itself is sealed, and thus does not require any lubricant. All internal parts are hardened sintered steel, the end caps and output shaft are stainless steel.